NRA-ILA | Show Your Neighbors you'll "Stand and Fight!" NRA-ILA has been offering three yard signs for sale featuring our “Don't Tread on my Gun Rights”, “Vote Freedom First” and “I’m the NRA & I Vote” slogans. Sales of these signs have greatly aided our efforts to raise gun owner awareness, and to raise the funds we need to accomplish our goals this year. Due to the popularity of these three signs, NRA-ILA has designed a fourth sign that is now available! Our newest yard sign highlights our newest slogan: “I Will Stand and Fight with NRA”. Made of the same high quality materials, the new “I Will Stand and Fight with NRA” sign is bold, durable, and easy to assemble. Everything needed to assemble the sign is contained in one compact package, and all components are made in the USA. Whether you wish to purchase a single sign for $15.95, a two-sign pack for $26.95, or a four-sign pack for $49.95 (includes shipping), a portion of the proceeds will go directly to NRA-ILA to assist our efforts to protect, preserve, and strengthen our Second Amendment rights! 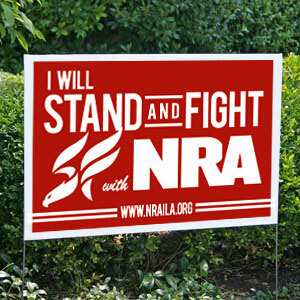 To see the latest “I Will Stand and Fight with NRA” sign, and to order your NRA yard signs, please call (866) 869-6389 or visit www.nrailasigns.org.